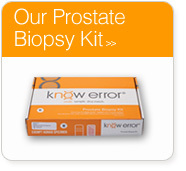 Genomic testing directly from Know Error swabs, no additional specimen collection required. Guidelines for 2019 suggest that physicians test their prostate cancer patients for germline mutations in BRCA and several other genes. The guidelines call for testing all patients with Gleason score (GS) 8, 9, 10 or metastatic (METS) disease (regardless of family history); and patients with Gleason score 6 or 7 with strong family history of cancer.1 Findings from recent publications2 concluded that prostate cancer patients with these mutations may have more aggressive cancer. Patients with repair gene mutations should be considered for alternative management and treatment approaches. 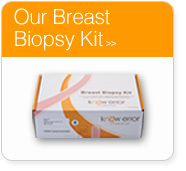 BRCA testing is performed on the patient’s germline DNA. Strand uses buccal swabs already collected with the know error® system to obtain germline DNA samples sufficient to run its UroSeq™ prostate gene panel test (BRCA1, BRCA2, ATM, CHEK2, HOXB13, PALB2, RAD51D, MLH1, MSH2, MSH6, PMS2, and EPCAM) in accordance with 2019 guidelines.3 Ordering UroSeq™ is convenient and easy, there is no need to call the patient back to provide another specimen, nor a need to order a special kit. Since Strand routinely receives the pathology reports with the order to test Know Error, we can help determine what patients need tested based on the Gleason Score and from whom family history is needed. Physicians can call to order the UroSeq™ panel testing or we can accept a standing, written order that will allow us to proceed with testing automatically as appropriate for each patient. • We are compliant with MolDx/CMS requirements to verify the source and purity of genomic test results. Please contact us regarding any questions about the new guidelines or our test. 1 Strong family history consists of: brother or father or multiple family members dx with PCa under 60yrs old; OR known germline repair gene mutations (e.g. BRCA2, LYNCH); OR more than one relative with breast, ovarian, pancreatic, colorectal, endometrial, gastric, kidney, small bowel, urothelial, bile duct cancer. 2 Pritchard CC1, Mateo J, et al; Inherited DNA-Repair Gene Mutations in Men with Metastatic Prostate Cancer. New England Journal of Medicine; 2016 Aug 4;375(5):443-53. doi: 10.1056/NEJMoa1603144. 3 NCCN® Guidelines. NCCN® is the registered trademark of the National Comprehensive Cancer Network, Inc.